We have collected some most unique houses that you’d want to live in. Check them out below. The Heliodome in France is a house that will both save energy and make your life very comfortable. The solar panels on the house help it stay cool in summer and warm in winter. The place can be visited for tours. Who knew that blocks stuck one on top of each other could form a block of apartments? This amazing structure was built in Montreal, Canada, by Moshe Safdie. At first, it was not supposed to be anything but his thesis, but people actually live in this amazing community building! Futuro is a prefabricated spaceship-shaped house designed by Matti Suuronen, and it can be found around the world. But most of these houses are located in Finland, the architect’s homeland. The Mirror Houses in Bolzano, Italy, are difficult to notice thanks to their unique “mirror” design that makes them disappear from the surrounding area. Upon your arrival, a whole new conceptual house is at your disposal. Most importantly, you can rent it for holidays or events! 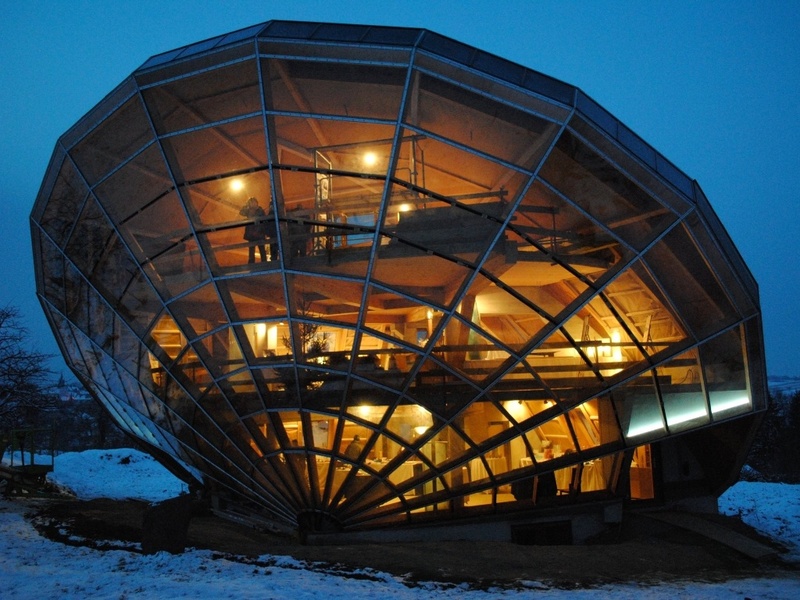 This mechanical hobbit-like house in the Czech Republic has won many awards for eco-living and eco-housing. It took almost 3 decades to build, but it will certainly stand longer without a doubt. A true piece of art, the Nautilus House in Naucalpan de Juarez, Mexico, built by Javier Senosiain, can only make one’s life brighter and beautiful. It is open for public viewing throughout the year. This stone house in Portugal is a private property, surrounded by a fence. It certainly reminds us of a time when humanity lived in caves because the whole place is carved into a stone. It is not clear who lives there, but one thing is certain: it attracts so much attention that the owners put up “Private Property” signs. The cubic houses in Rotterdam are privately owned. Their unique appearance has gathered a lot of attention. Yet it is possible to stay there, and many accommodation websites feature apartments there. You only need to book and see this fantastic cubic structure for yourself. This shoe house in a park in the Netherlands is so cute and cozy that it looks like it jumped straight from a cartoon. And we are right to think so! This is the home of Alfred J. Kwak from a 1990 Dutch cartoon of the same name. Another Shoe House is situated in the South African province of Mpumalanga and was built in 1990 by entrepreneur and artist Ron Van Zyl. It was inspired by the old nursery rhyme “There Was an Old Woman Who Lived in a Shoe.” It’s now a museum with the artist’s works, and it’s part of a whole complex that includes a guest house, a restaurant, a swimming pool, and a curio shop. This futuristic house in Nehusha, Israel, was built by the French architect Ephraim Henry Pavie. It is eco-friendly and looks so stunning you’ll definitely want to buy it one day! A zoo in Getorff, Germany, has got itself a house that is far from ordinary — it stands on its roof! Visitors are allowed all year, so feel free to stop by if you find yourself nearby in the future. Yes, this is a Mr. Toilet House. Located in Suwon City, South Korea, this toilet-shaped building is open for visiting all year. It also hosts events such as exhibitions and concerts.